FACT: Forcing children to attend school does not fix truancy. Zero Tolerance, a truancy reduction program, has been designed to provide such guidance. It educates and trains caregivers of children with a record of school truancy, or who are showing signs of school disengagement due to chronic absences, in the tactics of intervention and prevention available to them. Parents are asked to examine their influence on their child’s behavior, and to consider the changes they need to make in an effort to help their child succeed. As lessons are taught and ideas flow between Zero Tolerance participants, caregivers begin to feel supported and become “unstuck” in their responses to obstacles. How to parent more effectively. 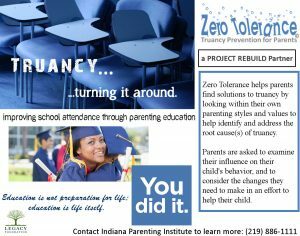 Currently, Zero Tolerance is a part of the City of Gary’s Truancy Court program, Project Rebuild. To learn more about that program, click on the logo to the right.